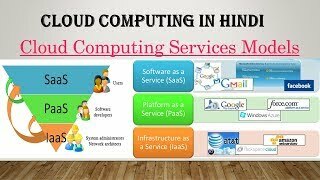 Welcome Guys, in this video we will see what is Cloud Computing Services Models SaaS PaaS IaaS in Hindi and Difference between SaaS PaaS IaaS with examples in tabular format in Hindi. SaaS - Software-as-a-Service in Hindi. Also difference between iaas, paas and saas in tabular form with examples and The Apllication of IAAS PASS and SAAS in cloud computing.